Preparing for the school administrator job interview questions you will be asked is probably the most overlooked phase of securing a new principal or any other education leadership position. Everyone thinks it is easy until they enter an interview room in front of a panel of educators who are judging every move and every word. The panel might include the superintendent of the school district, school principals, teachers, and parents, making it critical to address your answers to all involved. The more you prepare for an education job interview, the better your odds will be of securing a job offer. 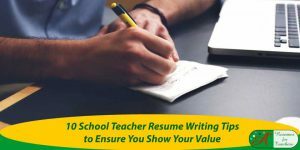 If you took the time to write an achievement based, skill-focused educational leadership resume with accomplishments, it would assist you to ace the school administration job interview. Get prepared for your next educational leadership job interview. 1. Why do you want to move into school administration? Be a: Principal? Vice Principal? University/College Administrator? Assistant Superintendent? If you have not already, mention your love for children and your wish to make a greater impact on their education by becoming an administrator. This question also addresses the job for which you are applying. Create at least two reasons why you are anxious to get the job. For example, if you want a vice principal’s position, perhaps it’s because you enjoy interacting with students while dealing with discipline and helping students become more successful in school. You are a visionary and have the ability and desire to see the big picture or a school community and get excited when you know your decisions will be instrumental in the academic and social growth of students and teachers. You can further state you would be in a position to motivate and make sure no one gives up on the students. If you are interested in becoming a university/college administrator, perhaps it’s because you enjoy finance, program planning, public relations, student retention, and maximizing resources. 2. Why do you want to leave your current position? Interviewers want to find out why you are moving on from your past position. If you were fired or let go from your previous school, you shouldn’t lie about this. A background check will easily find you out, so you need, to tell the truth from the start. If you were fired as the result of a school closing, downsizing, or layoffs, explain this and tell them that you were not fired for your mistakes or poor performance. If you were fired due to a more serious issue like breaking a school policy, not meeting your teaching goals, or due to not getting along with your principal, tell the interviewers why you were asked to leave but try to paint it in as positive a light as possible. Don’t elaborate. If you left of your own accord, be direct in your answer and focus your answer on the future, especially if leaving wasn’t under the best circumstances. Regardless of why you left, don’t speak badly about your previous employer. If you do, this may cause the interviewer may wonder if you will bad-mouth his district/school next time you’re looking for work. Although it’s paramount, to tell the truth, you need to use some tact when it comes to describing any negativity in your past position. If you tell your interviewer that your last employer was terrible, that they didn’t pay you enough, the hours were awful, and you hated the job this will leave a negative impression. There isn’t room for growth with my current school, and I’m ready to move on to a new challenge. I’m looking for a bigger challenge and advancing my career. I couldn’t job hunt part-time while working. It didn’t seem ethical to use my former school’s time. I’m relocating to this area due to family circumstances and left my previous position to focus on moving. After several years in my last position, I’m looking for a school where I can contribute and grow in a team-oriented environment. I recently received my administrative degree, and I want to utilize my educational background in my next position. 3. What are your professional goals for the next 5-10 years? Never mention your plans to move to another area or take time off to have a child. This is also a great time to list some of your professional goals for the school you are applying for. State that you’d like to have the school renowned for its testing scores, its graduation rates improved, its technology increased, or its student retention increased. 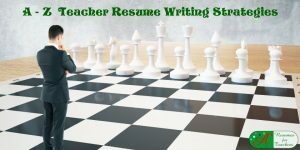 Showing that you have specific goals for the school will put you in the forefront as a serious administrative candidate. 4. Tell us a story about yourself. Whatever story you decide to tell in this situation, make sure that it has some relevance to the world of your professional endeavors. The tale you tell should demonstrate, or refer to, one or more of your key behavioral profiles in action – perhaps honesty, integrity, being a team player, or determination. If you choose “team player” (maybe you’re the star player on your intermural basketball team), you can tell a story about yourself outside of work that also speaks volumes about you at work. The best way to answer this question is to tell a story that reveals something about your character and experience. A great story to tell about this situation is how you got started in education. What made you want to be a teacher? What made you want to transition into administration? You can use an unusual educational situation in which you have been involved and describe it briefly. It could be a time when you showed your humorous side and improved the school community morale, climate, culture, and spirit. Make sure it makes you look good! 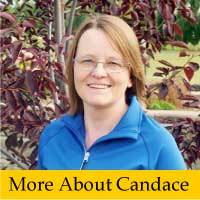 Explain how you were motivated to become a school administrator. 5. 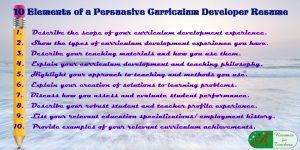 What is your philosophy of education? A brief statement of why you became an educator. Mentors you have had and what they taught you. A statement about the purpose and importance of a good education in a student’s life. The nature of the learning environment in a school, for example, challenging, enjoyable, safe, open, and supportive. Your preferred administrative (leadership) style. Ways in which you communicate with staff members, parents, and students. How you will provide an excellent role model for students. Ways in which you would like to improve education. How your school will meet students’ individual needs. The values you want students to learn including responsibility, good citizenship, hard work, caring, conflict resolution, excellent people skills, and honesty. How you want to be remembered by students, parents, teachers, and others. Your ultimate goal as an educational leader. 6. Why should we hire you over all the other applicants who have similar educational backgrounds and experience? This is a difficult question as you cannot rely on your education and experience to sell yourself. What hiring panels are looking for when they ask this question is whatever you feel is most important to share with them. They’re looking for candidates who avoid canned responses. They are seeking to learn how you see yourself and what you value about yourself. You should focus on your best qualities, such as your work ethic: Did you work your way through college? Or were you the first in your family to earn a university degree? ; your background in other areas: finance, fund-raising, charity work, adult education, training student teachers, ability to speak a second language, grant writing; maybe you have a license in special education, and so forth. Interviewers like to hear about your tenacity or “stick to it” attitude even when things get difficult. Interviewers also want to hear about responsibility, integrity, kindness and a love for children, as well as a desire to make a difference in their lives. But don’t just focus on your love for children. That is not enough to set you apart from the other candidates. The panel wants to detect a sense of professionalism and wants to hear what is in your heart. Make sure you express a real passion for improving education and helping students maximize their potential. 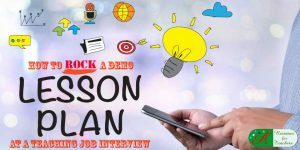 If there is a compelling reason, the hiring panel should hire you, make sure you mention during and at the end of the interview. Take a minute or two to tell why your unique selling feature will benefit the school district. Perhaps in your last position, you and your staff raised test scores a significant amount or turned around a school with student gangs. 7. Who has most influenced you to become an educator/administrator, and how did they influence you? Try to make your response to this question as personal and as sincere as possible. Maybe you will need to spend some time thinking to figure out the real answer to this issue. The panel wants to know your motivation for entering into the education sector and if there was anyone that influenced you and how you discovered your passion. Mention one or two university professors, other educators, or family members who have positively impacted you and tell how they did it. Maybe you had a special teacher growing up that made you want to become a teacher. If none come to mind, consider mentioning the mentor/coach who guided you through student (intern) teaching or your current principal. 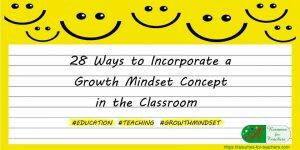 You could further say as you read and learned more about education and learning your interest in becoming an educator continued to grow. 8. Describe the best teacher, parent, and student you know. One or more teachers have positively influenced most of us in our educational career. We get into education because some teacher made a profound difference in our lives. 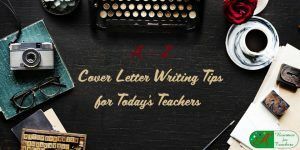 Let the interviewer know about the best teacher you know, what makes them great and how they have influenced your education beliefs. This is the time to be passionate, sincere, and complimentary. Make sure the interviewer knows precisely how you’ve been influenced and precisely how you will affect others. The same method will work when describing the best parent you know. What characteristics does this parent have? What makes them so great? He/she is probably very involved in their child’s life, incredibly supportive and encouraging, and provides a very structured environment. This parent will no doubt also be actively involved in their child’s academic lives, be participating in school activities, volunteering in the classroom, and staying up-to-date with school work and their child’s progress. Finally, you will need to describe the best student you know. This student will probably represent the very reasons why you wanted to enter education in the first place. He/she is likely to be enthusiastic and eager to learn, is cooperative and helpful with other learners, is social and friendly, respects the rules and the learning environment, and puts forth a strong effort in their education. 9. What interests do you pursue outside of the classroom? This question offers a prime opportunity to differentiate yourself by presenting a vivid description of your life outside of work. Schools are interested in balanced, likable applicants. Your professional life is only part of an interrelated whole. Schools expect you to demonstrate the same level of dedication and passion in outside activities as you do in administration. They are also well aware that many of the best work-related ideas occur when people are not at work, so what you do out of the school has a measurable impact on what you can do on the job. Besides, funny, offbeat, interesting people make work and school more exciting and often are better at out-of-the-box thinking. Communicate feelings of passion, commitment, and devotion. Wherever possible, demonstrate the leadership abilities you have developed in these activities. To answer this question, make a brief statement about your interests and hobbies. If you have a family, mention that you enjoy spending time with them. Do not mention parties, drinking, or other pastimes that will give a poor impression of you. Reading and sporting activities are also good to mention. 10. What is your most significant achievement in education? Choose your most significant achievement in education and briefly, describe what you did, what skills you used, and how you did it. 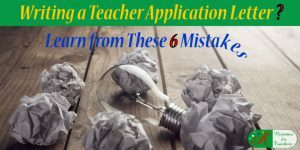 Consider mentioning: implementing curricular changes, establishing a school-wide discipline program, creating a tutoring program, earning a Ph.D., helping raise test scores, implementing an anti-gang or anti-drug program, creating a program for second language learners, writing a book, or creating a program for music or the arts. Dedicate time to prepare for any potential school administrator job interview questions in advance. Failing to prepare is preparing to fail. Don’t get caught off-guard. If you are having a difficult time narrowing down your achievements to just one, try to pick one that you are most proud of or one that deals with an issue that is important to the school you are applying for. For instance, if the school you are interviewing with is struggling with bullying, it would be great to mention your experience with introducing successful anti-bullying campaigns. To discover your accomplishment, answer these questions: What was the challenge? What was the action and skills you used? What was the result of your actions? Boosted high-risk students’ academic and social success through coordinating with 150 special education educators in implementing 2500 IEPs to appropriately modify instruction, services, and expectations for students referred for special education placement. 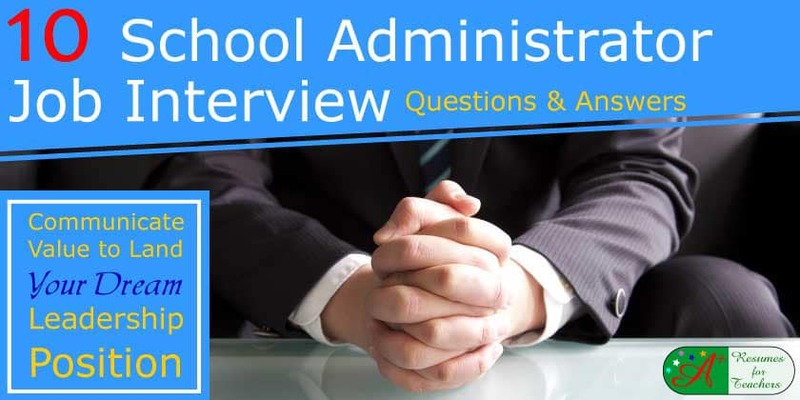 Identifying your greatest strengths to a critical exercise to help you answer the school administrator job interview questions you will be asked. Know them inside and out, choose educational leadership strengths that are RELEVANT and most VITAL to success in the position you wish to secure. After you identify these strengths, be prepared to back up your core competencies with evidence, such as real stories or examples to prove you have that strength. Don’t forget to follow up after the interview to get the best job hunting results. As you know, preparing for your next education leadership job interview is critical to a receiving a job offer. 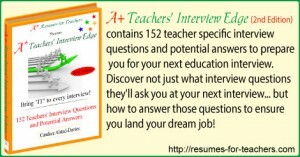 Review 142 additional school administrator job interview questions. 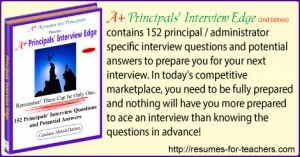 Check out this exceptional resource: A+ Principal Interview Edge eBook. You can find our principal interview eBook here, along with our other education-related eBooks and resources to help you with your job search. 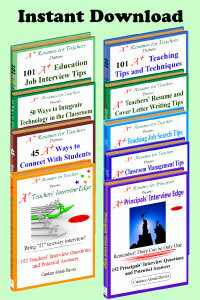 We also have the A+ Teachers’ Interview Edge – 152 teacher job interview and answers. Instant download.